Welcome to 3rd night level missions in Girls Frontline! Area 3 is useful in leveling as well as earning one of better sought out personal equipment for ST AR-15. 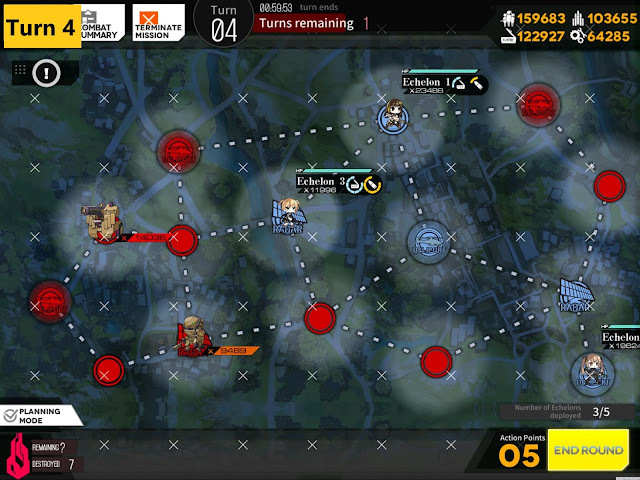 The mission difficulty depends on how well your RF dolls are leveled and linked. 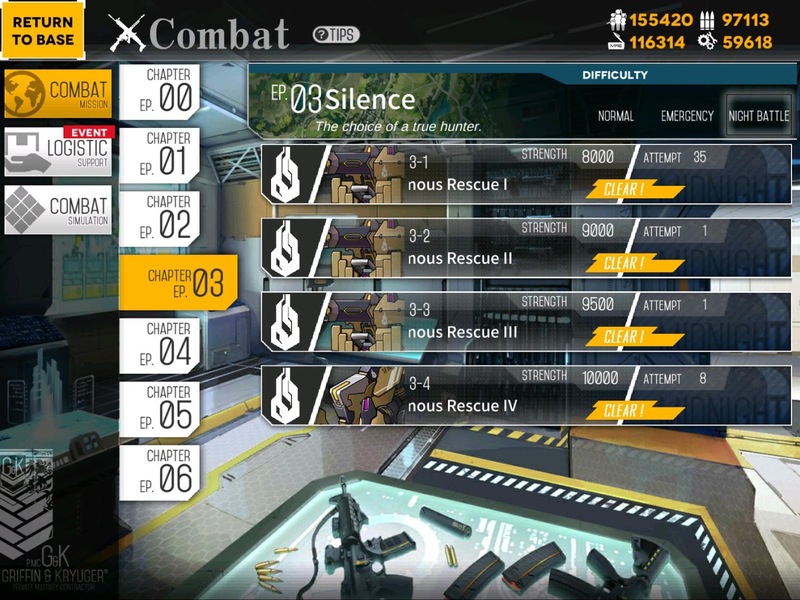 This is area that I will revisit in the future to post efficient ways to run the 3-4N mission specialized on farming the ST AR-15’s equipment. But to do that we will need doll from future Campaign… Operation CUBE. Two things that are important here: move once so that you can spawn support echelon on helipad before moving to enemy helipad. Another important part is that make sure you are spawning Friend Echelon with HG in it so it still provides vision to starting helipad in Turn 2. My apologies: I forgot to take picture of end of turn 2 so I replaced it beginning of turn 3. Green arrow is indicating direction that Friend Echelon should have moved. For me all the remaining enemies were visible on the screen so it was easy what to do. 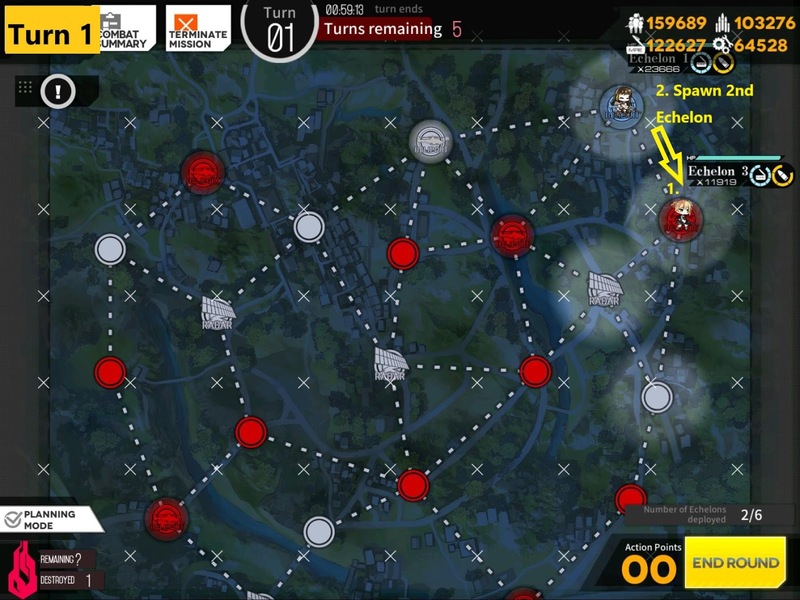 If that is not the case for you, just remember that you have another turn to sweep the map of invisible nodes. 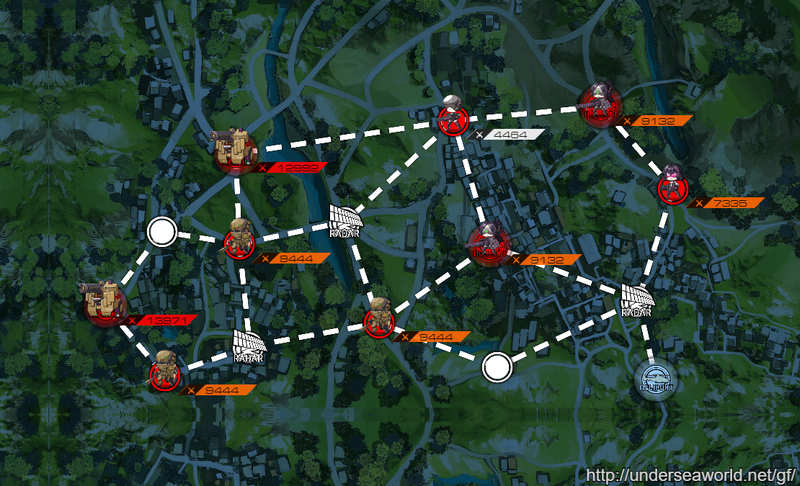 Map View. It’s gonna be a weave of normal and armor. Make sure you start with AR echelon on top, and RF echelon on bottom. 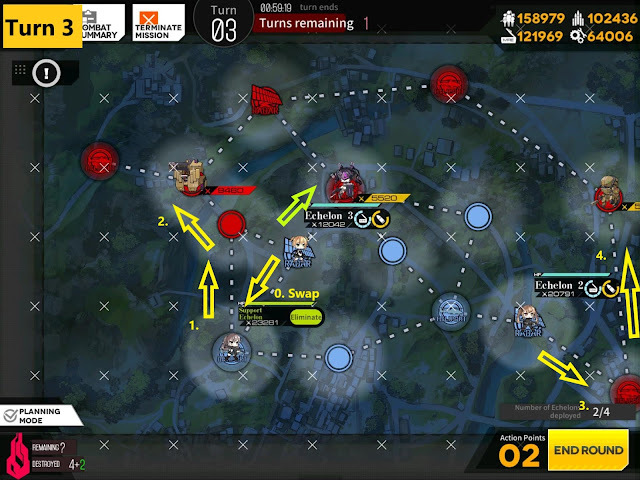 AR moves to take out all normal units on top, RF moves to kill armor unit on the bottom. Make sure you swap before turn ends so RF echelon can take on that armor unit to the right instead of your AR echelon. 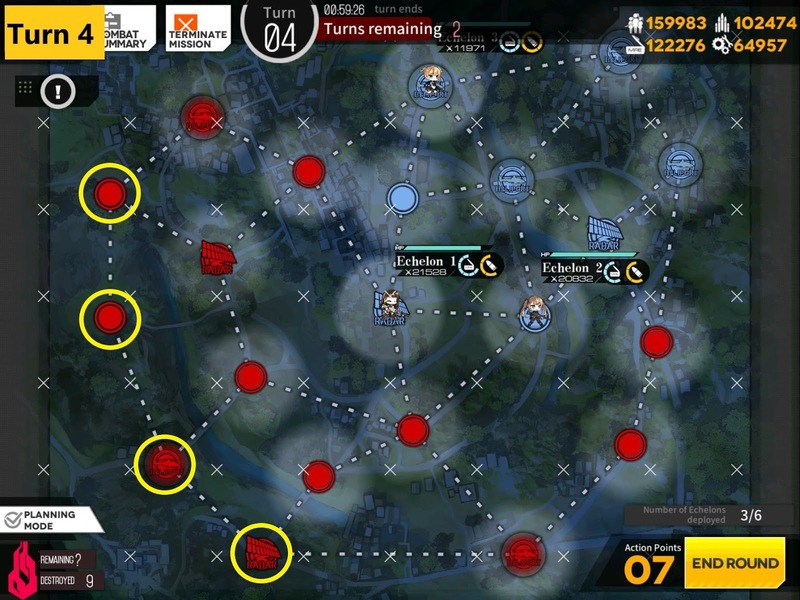 We have enough action points to cover all nodes in turn 2. Make sure you swap again before moving AR and RF echelons. AR on top, RF on bottom. 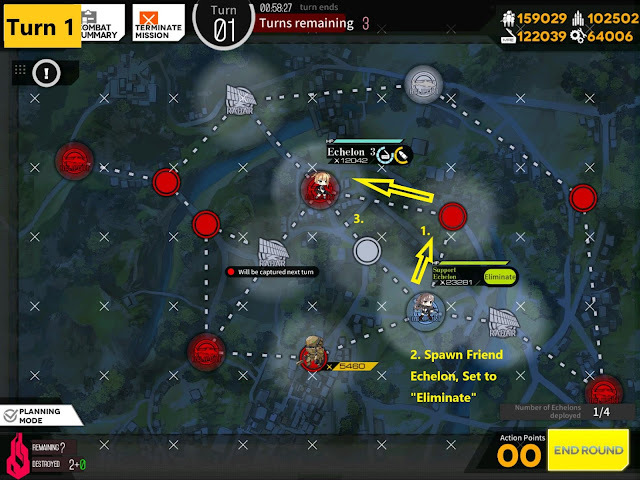 Use 1 remaining action point to kill remaining unit to end mission. 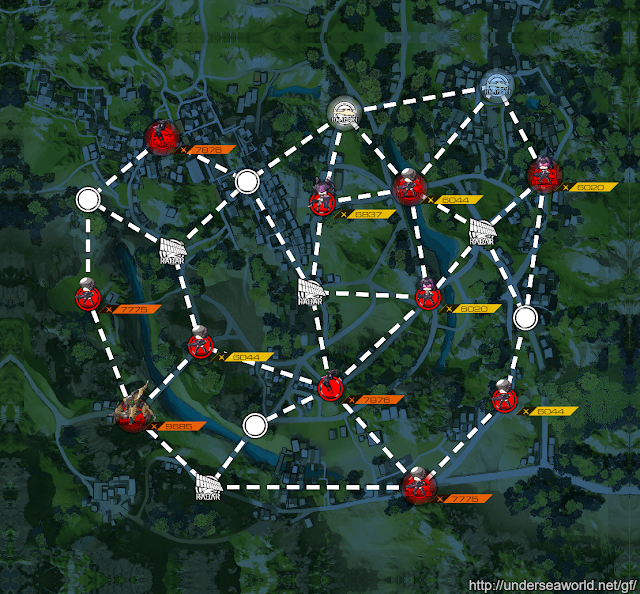 Spawn RF and AR echelon each. 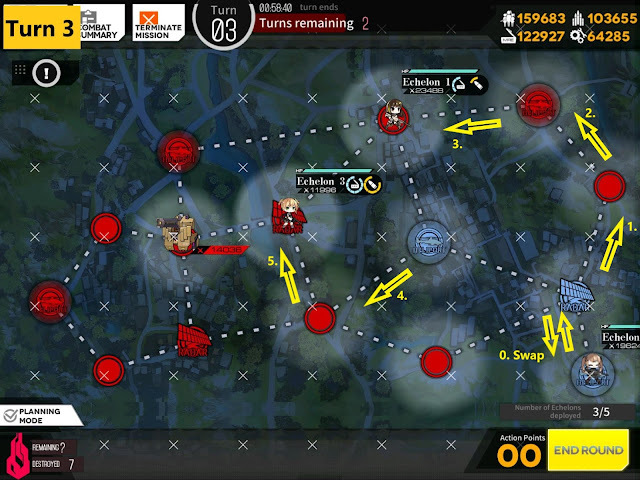 Make sure AR echelon is on radar before ending turn. This is bit complicated so I have used 2 colors for arrow [RF is red and AR is yellow]. 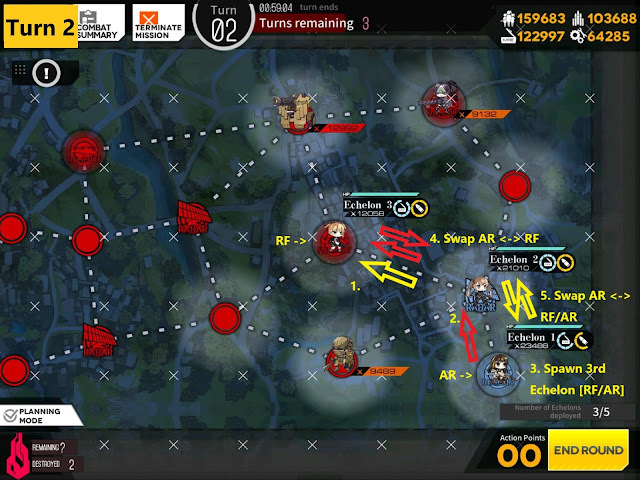 Basically use AR to take helipad with normal unit on it, move up RF from helipad to radar, swap with AR, Spawn 3rd Echelon with ability to take on armor, swap AR and 3rd Echelon so that both echelon that will get attacked will take on armor units. 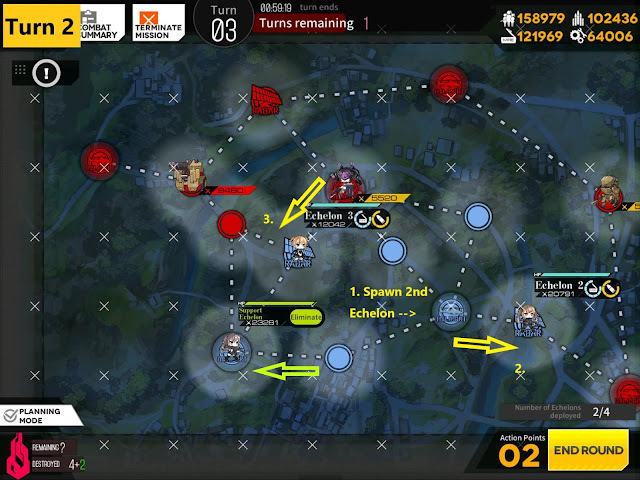 At the start of the turn, AR echelon swaps back with 3rd echelon, then moves counter clockwise around the edge of the map. RF moves to take radar node. 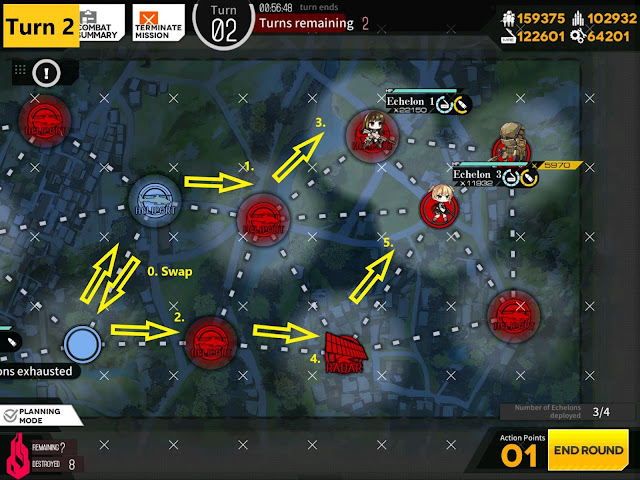 This is beginning of turn 4. you have enough movement points for RF echelon to kill remaining units. 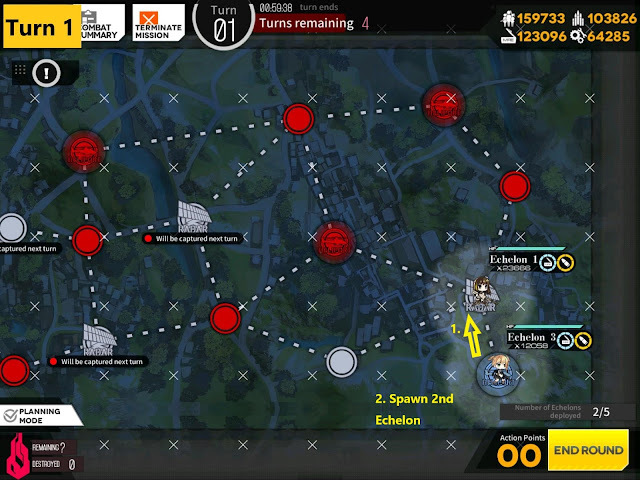 Make sure you resupply if you think echelon is going to battle more than 5 times by itself. Map View. 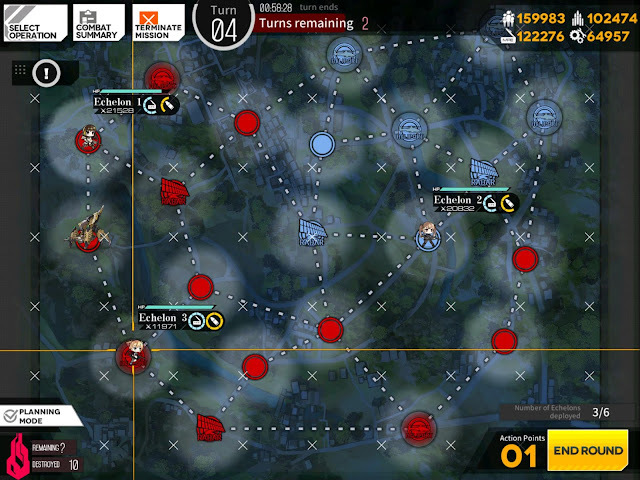 It’s large map, but surprisingly easy to beat in turn limit. The goal of this map is to get helipads that’s surrounding the starting point and revealing maps via radar nodes. 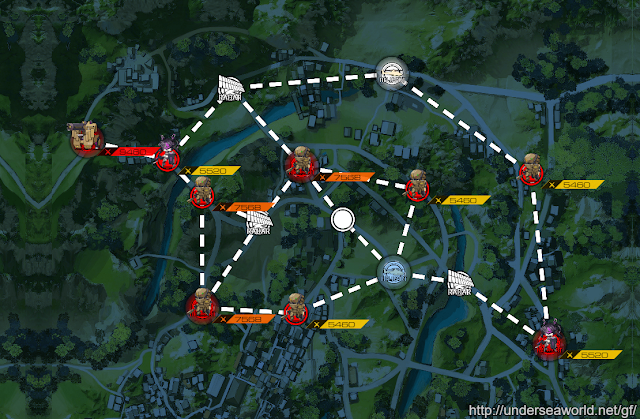 Also RF squad should avoid fighting with normal units until you see the manticore unit. I ended up swapping the RF echelon back to the starting point and moving AR to take radar [1~2]. 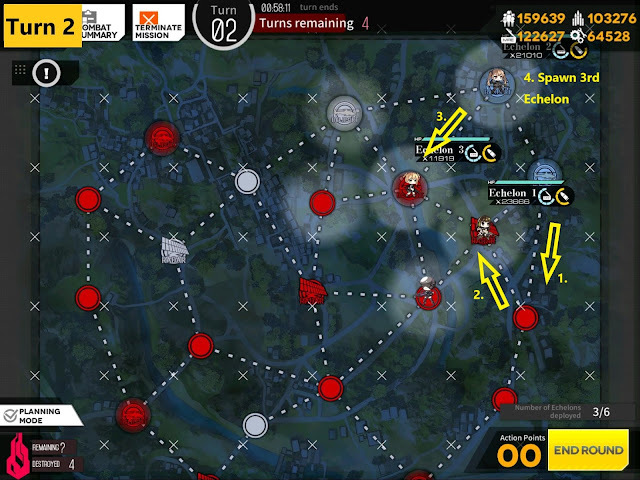 Then I swapped RF back to starting point again to switch place with 3rd Echelon I spawned. 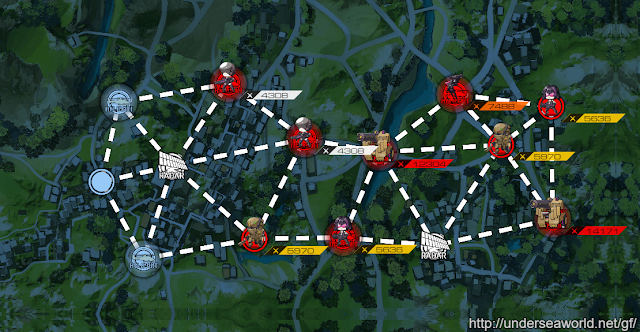 Again this is to avoid RF echelon fighting with any normal units. 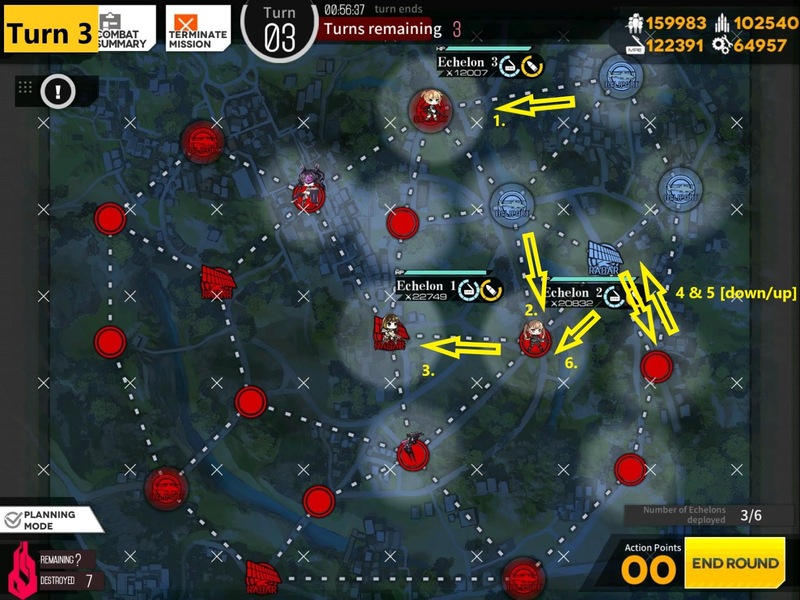 Working on radar nodes in the middle this turn. Echelon 1 moved towards radar either moving left down or down left depending on which tile had enemy unit. 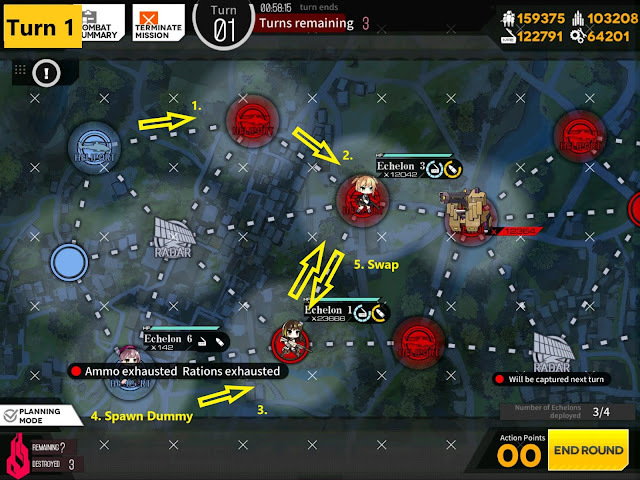 Echelon 2 took care of enemy unit on the right [4&5] then moved to support Echelon 1. RF echelon moved one to left to take helipad. This shows beginning of turn 4, which shows clear map except for 4 nodes circled in yellow. Since you have 2 turns remaining and 7 actions points each turn, there should be no problem locating Manticore unit and killing it.